An interdisciplinary, international forum for sharing knowledge about the application of Geoinformatics with focus on application and on developing countries. 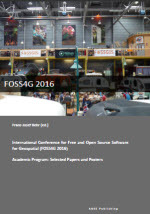 This Conference Proceedings is a collection of selected papers and posters submitted to the Academic Program of the International Conference for Free and Open Source Software for Geospatial (FOSS4G 2016), 24th to 26th August 2016 in Bonn, Germany. Again geospatial open source software was the focus of a well-attended international conference flanked by presentations on open standards and the open data movement, a meeting place for open communities. Similar to previous FOSS4G conferences at the national and international level, the academic papers and posters cover an extensive wide range of topics reflecting the contribution of the academia to this field by the development of open source software components, in the design of open standards, in the proliferation of web-based solutions, in the dissemination of the open principles important in science and education, and in the collection and the hosting of freely available geo-data. The 8th International Summer School of Applied Geoinformatics for Society and Environment (AGSE2017), which was co-organized by University of Applied Sciences Stuttgart, University of Tehran, German Academic Exchange Service (DAAD), and International Society for Photogrammetry and Remote Sensing (ISPRS) held at the Kish International Campus University of Tehran, Kish Island from April 29 to May 04, 2017. The overall goal of this conference was to take into account the current state-of-the-art in Geosciences related disciplines such as photogrammetry, remote sensing, and geo-information topics to a wide range of application areas, with significant focus on "Crisis and Disaster Management". During this summer school different practical and educational workshops have been conducted by outstanding and internationally known researchers on different fields of geospatial data acquisition, analysis and application. Generally, about 23 articles and works in progress and about 11 workshops were presented during five days. The scope of the presentations covered the latest science and technology developments as well as recent applications and research activities for crisis and disaster management, risk assessments, monitoring natural and man-made disasters, based on earth observation or ground based techniques as well as the other contribution of geoinformatics, remote sensing, and planning to preparation, response, recovery, and mitigation of disasters. 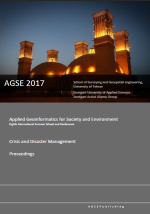 The overall success of AGSE2017 summer school was demonstrated by the impressive attendance, with more than 50 participants from universities and research organizations, but also from application oriented institutions, primarily from Iran but also from twelve other nations such as Germany, France, The Netherlands, Colombia, Kenya, Bangladesh, Ethiopia, Sri Lanka, India, Nigeria, Nepal, and Tanzania. Applied Geoinformatics for Society and Environment (AGSE) series of conferences and summer workshops started in 2008 in Trivandrum, initia ted by the initiavtives of Dr. Pradeepkumar (University of Kerla) and of the Alumni Representa tive of Stuttgart University of Applied Sciences, Prof. Dr. Franz-Josef Behr. After the successful follo w-up conferences in Stuttgart (2009), Arequipa (2010), Nairobi (2011), back in Asia (Johor Ba hru, Malaysia, 2012, and Ahmedabad, India, 2013). The objective of the conference is to 'take the benefits of geographic information technologies to a wide canvas of applicable areas, particularly in the realms of development, environment and social well-being'. Since 2008 we â€“ scientists, practioners, students, alumni â€“ continue this path to empower one another in a participative way. I wish this event a successful exchange of knowledge crossing borders and disciplines. This International Conference is organized with the aim of promoting geospatial technologies for society and environment and 'to offer an interdisciplinary, international forum for sharing knowledge about the application of geoinformatics with focu s on the Millennium Development Goals'. 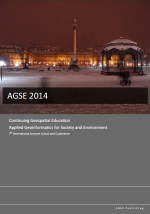 AGSE is about empowerment and participation, and offers a platform for scientif ic contributions from academia and researchers about recent developmen ts in geospatial information technology and applications. The AGSE2013 brought together specialis ts, practitioners, academ ics, students and the public to this common platform. There were 125 pa rticipants from six countries and 20 states of India, in this four-day event which comprised presentations based on a variety of topics and key note addresses from various renowned scientists. Each theme was monitored by the Chair and Co-Chair. The best papers were awarded during the valedictory function. 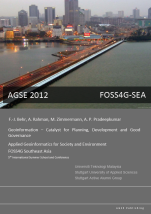 Sharing knowledge about the application of Geoinformatics with focus on application and on developing countries is the objective of the proceedings of AGSE 2012, co-organized by Stuttgart University of Applied Sciences, Germany, and Universiti Teknologi Malaysia Johor Bahru, Malaysia. The objective of this international interdisciplinary forum is to 'take the benefits of geographic information technologies to a wide canvas of applicable areas, particularly in the realms of development, environment and social well-being'. AGSE 2012 therefore pledges itself to align with the aims of the United Nations Millennium Development Goals. It also aims at internationalization of education and has become a venue where academicians, researchers, students, scientists and technologists from across the globe can come together in a very open environment of scientific debate and come out enriched from such encounters. The affiliations of the authors in AGSE2012 cover 21 nations from Germany, India, USA, Malaysia, Sri Lanka, Indonesia, Austria, Philippines, Italy, Nepal, Egypt, Bolivia, Bangladesh, Pakistan, Tanzania, Sudan, Kenya, Zambia, Lithuania, to Somalia and Romania and cover themes of current relevance to geoinformatics, i.e., Earth Observation Systems, Information Extraction, and Photogrammetry, Advances in GIScience and Current Developments, Spatial Data Infrastructures and Land Management, Environmental Issues and Sustainable Development, Disaster and Risk Management, Geoinformatics and Health, Urban and Regional Planning, GIS in Education, and Experiences and Business Development. The field of geoinformatics has shown tremendous growth not only in its technological advancement, but also in its applications arena in the realms of society and environment. 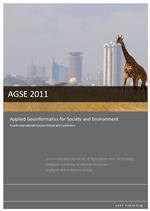 This book provides a cross-section of the application of geospatial technologies to a variety of fields as the compilation of submissions to AGSE 2011, the international forum for Applied Geoinformatics for Society and Environment, held in Nairobi. The affiliations of the authors cover many countries like Germany, Kenya, India, Malaysia, Sri Lanka, Indonesia, ... Fields covered are Earth Observation Systems, Information Extraction, and Photogrammetry, Internet-based Applications and Open Source Solutions, Spatial Data Infrastructures and Land Management, Environmental Issues and Sustainable Development, Natural Resources Management and Monitoring, Disaster and Risk Management, GI and Health. 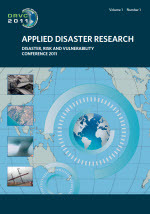 Proceedings Applied Disaster Research 2011: Disaster, Risk and Vulnerability Conference 2011, Mahatma Ghandi University, Kottayam, Keral, India, March 12 - 14, 2011 (sold out). The School of Environmental Sciences, Mahatma Gandhi University, Kerala, India was organizing a Disaster Management Conference entitled Disaster, Risk and Vulnerability Conference 2011 (DRVC 2011) from 12â€“14, March 2011, in association with the State Disaster Management Authority and the Indian Medical Association â€“ Kerala Disaster Management Cell. The conference brought together specialists, practitioners, academics, students and the public to a common platform. Discussions on disaster management, risk and vulnerability reduction can lead to increased awareness of disasters and its various hues, strategies for resiliency, and newer technologies for disaster management. This is an important component of the UN Millennium Development Goals (MDGs) which state that "Disaster Risk Reduction and increasing resilience to all types of natural hazards in developing countries can have multiplier effects and accelerate achievement of the MDGs." 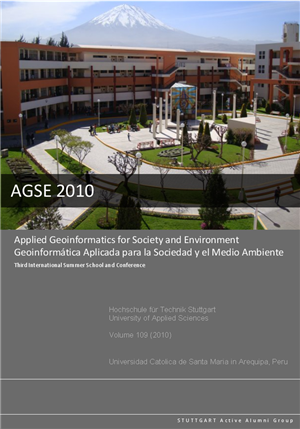 This book contains the submissions of Applied Geoinformatics for Society and Environment 2010 conference (AGSE 2010), co-organized by Stuttgart University of Applied Sciences, Germany, and University of San AgustÃ­n and Santa Maria Catholic University - Arequipa, Peru, covering scientific and application oriented tracks classed into 12 broad themes of current relevance to geoinformatics like Environmental Issues, Sustainable Development, Millennium Development Goals; Open Source Solutions and Tools; Internet-based Applications; Neogeography and Geovisualisation; Photogrammetry; SDI; LiDAR data analysis; GIS and health; GI Policy and Society, e-Government; and alumni experiences, mostly in English, but also with a few Spanish contributions. 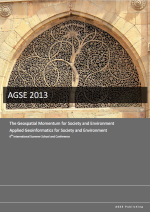 The Applied Geoinformatics for Society and Environment (AGSE) series of seminars was started in 2008 with the objective of taking the benefits of geographic information technologies to a wide canvas of applicable areas, particularly in the realms of development, environment and social well-being, seeking to align itself with the laudable aims of the United Nations Millennium Development Goals. Applied Geoinformatics for Society and Environment (AGSE) is an interdisciplinary, international forum for sharing knowledge about the application of Geoinformatics with focus on application and on developing countries. 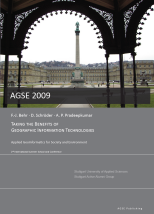 This volume comprises the contributions to AGSE 2009, held in Stuttgart / Germany, covering scientific and application oriented topics from seven broad themes of current relevance to geoinformatics, viz., (1) Environmental issues, sustainable development, millennium development goals, (2) Photogrammetry, earth observation systems, information extraction, (3) Spatial data infrastructures, E-Cadastre, (4) Internet-based applications, Open Source solutions (5) LiDAR data analysis and 3D visualisation, (6) Alumni experiences and business development and (7) Disaster and risk management, flood modelling, hazard prevention.